We are also available for emergencies! You. Your Health. Your Confidence. At First Hill Dental Center in Seattle, one of our main priorities is to educate our patients. While regular appointments with a general dentist are always recommended, there are easy ways to keep your teeth healthy between visits to the dentist’s office. When it comes to children, establishing a strong dental health routine is imperative, as it’ll prevent dental issues both now and in the long-run. Because it can be hard to explain the importance of preventative health care to children — who don’t necessarily have a concept that two minutes of teeth brushing tonight might save them a set of dentures in the future — we have compiled this list of tips to help incentivize children to brush their teeth. If it’s time for you or your child to visit a Dentist in Seattle, schedule an appointment today! Especially if you have multiple children, you can tap into the basic childhood love of competition. Buy or create a chart and list each child’s name — give them one sticker for brushing their teeth in the morning and one for at night. For more buy-in, allow them to choose stickers from their favorite show or fictional character. You could set a weekly goal for your children to get two stickers for everyday of the week, and reward this positive dental care with something special. As general dentists, we don’t necessarily recommend rewarding your children with candy or sugary treats, but it’s up to you to decide what your children will want. The best gift you can give is positive affirmation and praise; long after the material prize is gone, your children will have positive associations of dental hygiene. While we are focusing on kids in this article, everyone can benefit from a revitalized oral health routine. Turn teeth brushing into family bonding time. Additionally, your children pay attention to and start to mimic the actions they see you perform. When they see you brushing your teeth for at least two minutes every night and flossing, they see brushing their teeth as something they should do as well. One of the best strategies we have seen at First Hill Dental Center in Seattle involves making up a story about teeth brushing. If your child is currently into a certain baseball team, you could makeup a story where the toothbrush is their favorite baseball player and the plaque and cavities are the balls they must hit out of the park. Even if it seems childish, that’s the point. Change up the teeth brushing routine every once in a while. Children are engaged by new and intriguing things, so why not brush your teeth in different rooms of the house to keep the intrigue alive? As long as you have water and a place to rinse, you have a place to brush your teeth! You also want to remember that children are very attached to routine, whether they like it or not. This means that if you’re in a hotel, visiting grandma’s house, or on a road trip, your children might not automatically know to brush their teeth. 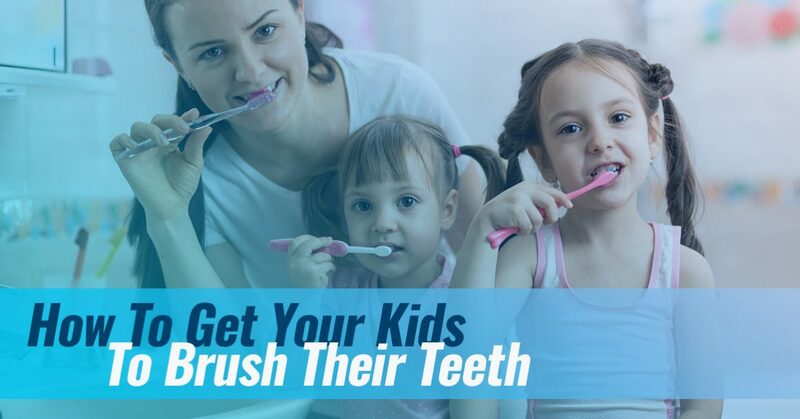 Set a time every night, no matter where you are, for your children to brush their teeth. Music is a fantastic way of creating routine. Choose a song that your kids love or at least recognize, and play it every time it’s time to brush their teeth. After awhile, your children will start requesting the song and will know exactly what to do when it plays. You can also have the winner of your teeth brushing competition choose the song for the next month to encourage more buy-in. It’s important that you give your children positive experiences at the local dentist. You want to choose a highly rated dental office that has experience with a range of dental care, from preventative to cosmetic. You also want to make sure your dentist is available for emergency appointments, as you never know what sports practice might lead to a chipped tooth. First Hill Dental Center in Seattle is conveniently located just 10 minutes from Pike Place Market. Call us today to schedule a dental appointment. Your ability to make a lasting first impression. Your beautiful, natural, perfect smile. We feel there is only one way to practice dentistry - with compassion, trust, and clinical excellence. We look forward to knowing you as friends as well as patients. To ensure your comfort and peace of mind, we offer stereo headphones to listen to music while enjoying a warm massage chair. We are conveniently located on First Hill, catering to Belltown, Downtown Seattle, Queen Anne, Ballard, Capitol Hill and other neighboring areas. A convenient parking garage is attached to the building. It is our goal to meet or exceed the needs of each patient through a unique blend of skills, insight, understanding and artistry. Please call us for any questions you may have about our office or the services that we provide.